With Christmas right around the corner we are compiling a Gift Guide that features only Gifts that are Made in America. If you are looking for the perfect Christmas Gift that is Made in the USA check out our Christmas Gift Guide to find some great ideas for everyone on your gift list this Christmas. We hope this 5 week series inspires you as you start your Christmas shopping with five weeks of different gifts you can give that are Made in America. 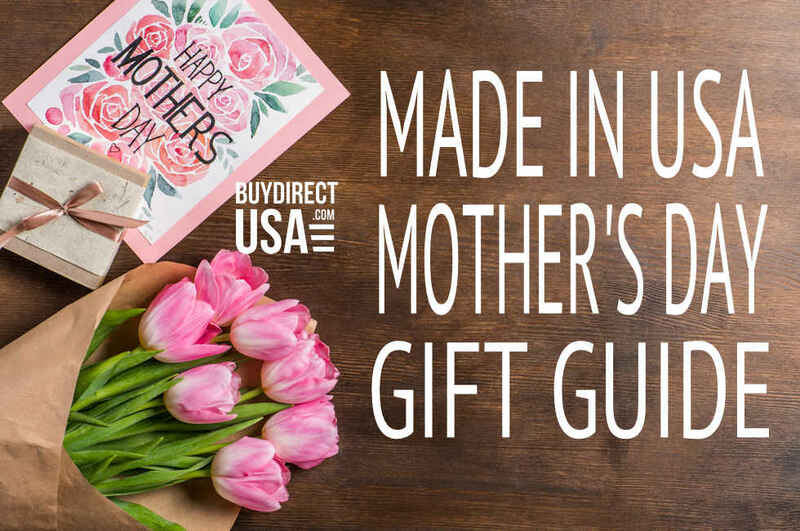 Check out these great Made in USA Gift ideas from some of our favorite manufacturers and retailers. P.S. Santa says order early to ensure delivery by Christmas! Whether you are setting a table for a casual dinner with family or an elegant party this pattern is perfect for either occasion. Each piece of flatware is made from 18-10 stainless steel and this pattern features an elegant teardrop shape. Order in a set or individual pieces. Liberty Tabletop is the only company that makes their flatware in America. Perfect for breakfast, lunch and even dinner. This griddle makes it easy to cook french toast, pancakes, bacon and eggs, grilled-cheese sandwiches and more. Plus it’s dishwasher safe to make cleanup easy. 360 Cookware products are Made in the USA. It’s like having a spa in your bathroom. A great way to pamper your feet and keep them feeling soft and looking great. The soft inner bristles gently massage your feet while the stiff outer bristles smooth rough/dry skin. Has an anti-skid surface and is mildew resistant. Gordon Brush is proud to manufacture this product and many others in their American manufacturing facility. Perfect for big holiday gatherings. Imagine all your family sitting at this beautiful table for Thanksgiving or Christmas. Crafted from reclaimed wood it is available in 4 custom sizes. DutchCrafters manufacturers their furniture and more in Sarasota, FL. Having guests this Thanksgiving and Christmas, but want to take a little of the hectic out of the holidays? Circle B Ranch has you covered. Their Holiday Ham Bundle includes: 1 Whole Ham (6-7# average), 1 Package of Nitrite Free Bacon, 1 Package of Marina’s Italian Style Meatballs, 1 Jar of Marina’s Tomato Sauce and 1 Jar of Marina’s Cranberry Chutney. A delicious way to celebrate the holidays without having to spend all your time in the kitchen cooking. The gift that will be used long after the Christmas decorations have been put away. This bench can be personalized with a message of your choice and includes a board that celebrates the holiday of your choice. that you can remove once the holiday is over. Additional holiday boards are available. Our puzzles provide a challenge, entertainment, and fun. Tridiculous! is a great beginner puzzle, and even has something unexpected for experienced puzzle solvers. Personalization and gift wrapping also available. More puzzles from beginner to advanced plus gift sets are available. Give the gift of a comfortable nights sleep with luxury bed sheets that are soft and designed to last wash after wash. Our bed sheets are made from 100% premium Supima® cotton. Available in our signature white, carolina gray and pacific blue. Our foot cushions will make your feet say Ahhh instead of ouch this holiday season. Providing comfort for your foot exactly where you need it. Plus they are re-usable. Great for stocking stuffers this Christmas. The most comfortable lounge pants you will ever wear. Plus they will keep you warm and cozy all winter long. Available for men, women and kids. Made from European double brushed flannel that is hand cut and sewn in the USA. 100% cotton. Choose from a variety of colors. Upgrade your pets food and water bowls with these stainless steel versions that are Made in the USA. They are heavy-weight, durable and dishwasher safe. This gift gets 2 paws up from our Mascat the American Ninja, Check out the product review. Perfect for someone who loves to bake and spend time in the kitchen. This quality stainless steel cookie sheet is made with 3-Ply construction that enables even cooking and delicious results. Take 15% off your order when you use coupon code: BuyDirectUSA. The ultimate gift for pizza connoisseurs. The Epicurean Pizza Set includes every tool needed to make exceptional pizzas from deep dish, thin crust, thick crust to crispy crust. This pizza lovers set includes: 16″ Perforated Pizza Pan for thin and medium crust pizza, 12″x2.25″ Deep Dish Pizza Pan with raised perforations, 16″x24″ WoodFiber Peel for handling hot pans and for cutting, Pizza Cooling Ring to prevent soggy crusts, Dough Docker for preparing dough, Pizza Wheel Cutter and Pizza Server. A great all day, every day knife. This little knife will be a companion that will do everything from opening boxes at the office to being an impromptu bug out knife and emergency blade. Available to purchase with or without leather sheath. A beautiful lightweight cotton blanket that is perfect for any room in your home. Made in the USA this gift will be a favorite year round. Available in antique and white. The Bates Mill Store is a proud, family-owned retailer of high quality American made textiles and is located alongside the Maine Heritage Weavers factory in Maine where all their products are manufactured. Not just for spring and summer gardens the Weed Dragon propane torch kits can even be used for ice and snow melting in the winter time. Choose from a selection of torch kits from the Red Dragon heavy duty torch kit, to the Weed Dragon to the Mini Dragon. Flame Engineering has a torch kit for everyone! And as always their product is Made in the USA.